These are stuffs I did a long time ago. But since I still have the board and some code, I thought I should post them here just in case somebody finds them helpful. This is a 8-bit AVR chip ATmega128 running off a 7.3728 MHz crystal. It's got 128 Kbyte of Flash, 4 Kbyte of RAM, 4 Kbyte of EEPROM, and a rich set of peripherals including 4 timers, PWM, ADC, SPI and UART etc. There are a lot of stuffs on the board - two quad 7-segment displays, two RS232 connectors, a real time clock chip, a temperature sensor, a 10-bit SPI DAC ship and a 4 x 4 button array, etc. 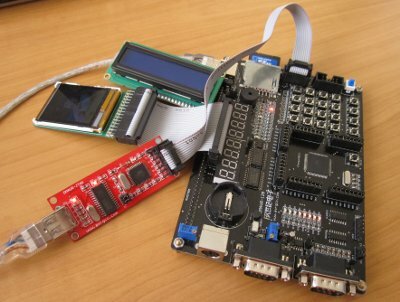 There is also a USB JTAG ICE clone based on ATmega16 for programming and debugging; and when I purchased it, they also gave me a couple of LCD displays. So, pretty awesome for a beginnger to try all these things out. I never tried to develop with this chip in Linux. So everthing was done with WinAVR in AVR Studio, under Windows. And I think for this particular family of micro, it's probably the best choice. I won't be able to say much about the experiments in the following sections as it's been such a long time. But I will compile the code and program into the micro just so I know they work. I'll also take some photos and paste the code there.